Floater fishing tips guaranteed to help you catch bigger carp! Floater fishing is not some magic art, although there are some anglers who do make it look easy. And there are some, notably floater fishing maestro Pete Springate, who catch carp on floating baits on days (even mid-winter) when other anglers would not dream of trying to catch on the surface. Of course, before floater fishing you should check it’s allowed on the water you intend to fish. Not all venues allow floating baits. These hints are all worth considering – good luck with your floater fishing this year! Enterprise Tackle Imitation Dog Biscuits sit beautifully in the water. Featuring a tapered shape and counter-balance shot, fish them on a hair-rig but nick the hook through the top for the perfect presentation. They also come with a foam insert which can be flavoured for added attraction. When it comes to hooklength, the choice will be determined by the venue and the size of fish. If it’s snaggy and the carp are big, try a floating braid. But if it’s clear of snags and the fish aren’t huge, a mono link of say 6 lb will encourage bites. Some modern hooklengths are designed to give strength and a fine diameter. Use the lightest hook you can get away with. Presentation is everything. This especially important on hard-fished waters, and anything too heavy will make the hookbait behave unnaturally and you’ll never get a bite. 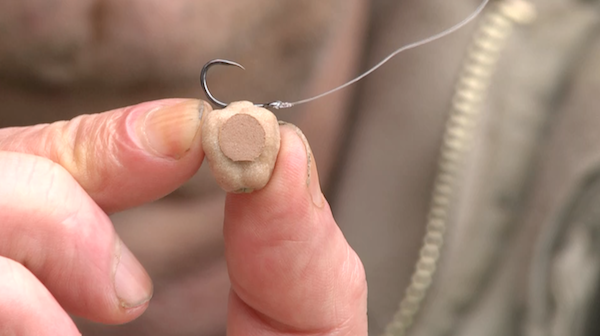 Don’t use a size 4 or 6 boilie hook for mixers -­ surface fishing often requires finesse. Try a size 10, 12 0r even a 14. Breadcrust is one of the all-time great surface baits ­ but it’s all about picking the right bread. Go for a freshly-baked loaf as opposed to one that’s pre-sliced. When it comes to the size of hookbait, don’t be shy. With big pieces of bread you can use a bigger hook as it will be disguised in the bait. Use a large square and mount on a size 6 or 4 ­ this way it will stay on the hook….contrary to the norm of trying to use smaller hooks! The main negative to using crust are birds. Overcome this by using fake bread instead of the real stuff. It has the added bonus of never coming off the hook. Don’t ignore cat biscuits. They not only come in all types of different sizes, they are often smellier, and more oily, than dog biscuits. It might sound slightly strange, but certain particles can work as surface baits. Sunflower seeds have been known to work brilliantly on hard-fished waters. But do prepare them properly by leaving them to soak in water for 12 hours prior to use. When it comes to picking a controller float, it all depends on distance. If you’re fishing at short to medium range a bubble float will do the job. But if you’re trying to reach fish further out then a heavier version is better. If you’re struggling to feed floaters at range, try attaching a PVA bag of biscuits to your hookbait ­ – that way you’ll ensure free offerings in the area. Better still, use a Spomb. One clever trick is to dispense with a shop-bought controller altogether and use a piece of twig or cut-down tree branch. Obviously you won’t be able to cast it far, but in terms of camouflage, it takes some beating. Simply wrap an elastic band around it and trap your line underneath. If you’re fishing at range, try the Enterprise Tackle Mini Mixers (pictured right). These come supplied with a sight tip in either fluoro yellow or pink. These sit on top of the biscuit and can be seen from long distance. Read Angler’s Mail magazine this week and every week for carp fishing tips and advice, exclusive columns, plus Where to Fish by experts you can trust, news, tackle and lots more.